Reducing the amount of desert dust swept onto snowy Rocky Mountain peaks could help Western water managers deal with the challenges of a warmer future, according to a new study led by researchers at NOAA's Cooperative Institute for Research in Environmental Sciences (CIRES) at the University of Colorado Boulder. With support from the CIRES Western Water Assessment (WWA) and NASA's Interdisciplinary Science program, CIRES' Jeffrey Deems and his colleagues examined the combined effects of regional warming and dust on the Colorado River, which is fed primarily by snowmelt. During recent years, desert dust has been settling thick and dark on the snowpack in the northern Rocky Mountain headwaters of the Colorado River, and snowpack is melting out as many as six weeks earlier than it did in the 1800s, according to the new assessment, published last week in Hydrology and Earth System Sciences. Snow dusted with dark particles absorbs more of the Sun's rays and melts faster than clean snow. Add the regional warming expected in the future, and the situation seems likely to grow more dire for the 40 million people who depend on the Colorado River for water. The river's flow falls by more than 20 percent by 2100 in some of the future climate scenarios Deems and his colleagues investigated. Moreover, warming could make dust problems worse, by increasing the risk of drought. "But we may be able to do something about dust," said Deems, who works with WWA and CIRES' National Snow and Ice Data Center. "If the future normal is this extreme dust scenario and we can push that scenario back to lower dust levels with land restoration or management, we could keep the snow in the mountains longer, and maybe even get some of that water back." That earlier work was based on the moderately dusty years of 2005–2008, with about five times as much dust than in the 1800s. 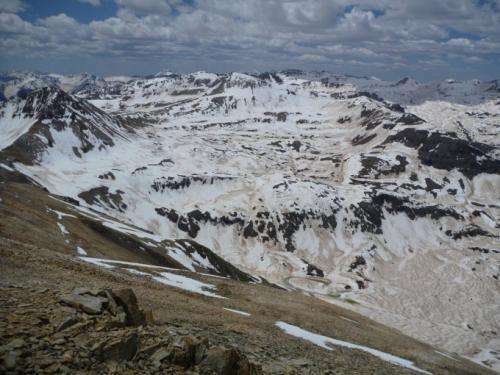 But during 2009, 2010 and 2013, unprecedented amounts of desert dust fell on Colorado snowpacks, about five times more than observed from 2005–2008. Moreover, other researchers have reported that climate change is likely to increase the frequency and intensity of drought in the Southwest, which could increase dust problems further by harming the grasses and shrubs that reduce surface wind speeds. For the new work, the researchers used climate and hydrology models to investigate the effect of that "extreme dust" on the Colorado River's flow now and in the future, as the Southwest continues to warm. Snowmelt in the extreme dust scenario shifted even earlier in the season, by another three weeks, pulling peak water levels in the Colorado River to earlier in the spring and leaving less water for later in the year. "In the Upper Colorado River Basin, the snowpack is our most important reservoir," said co-author Thomas Painter of NASA's Jet Propulsion Laboratory. "With continued dusty years and greater warming, water managers will have to make their decisions very early in the season. No longer will they have the nice long snowmelt season, shortened as it already has been, to see how snowmelt runoff is going." The research team also found a subtle shift on the total water loss in the Colorado River, from a loss of 5 percent estimated during the moderate dust years of 2005–2008, to a total loss of about 6 percent lost during extremely dusty years. This relatively small change is due primarily to the fact that as snowmelt creeps earlier and earlier in the year, the Sun's angle in the sky is shallower and provides less energy for evaporation than it does later in the spring. "Our results suggest that if we can adopt dust-reducing land management strategies and rehabilitate major dust sources, we can keep our snow on the mountains longer, and perhaps offset some of the emerging climate impacts," said co-author Brad Udall, director of the Getches-Wilkinson Center for Natural Resources, Energy and the Environment at CU-Boulder. "Dust reduction could be a very powerful strategy to help us adapt to the growing impacts of climate change on our precious water supplies in the American Southwest." More information: Deems, J. S., Painter, T. H., Barsugli, J. J., Belnap, J., and Udall, B.: Combined impacts of current and future dust deposition and regional warming on Colorado River Basin snow dynamics and hydrology, Hydrol. Earth Syst. Sci., 17, 4401-4413, 2013. DOI: 10.5194/hess-17-4401-2013.